Things haven't been going all that well for Ronnie Ortiz-Magro and his baby mama/on-again, off-again girlfriend Jen Harley. The two have been having relationship issues even before the birth of their daughter, Ariana Sky, and the fights have been both incredibly public and incredibly volatile. It seems like they've reached a boiling point with their latest incident, however. Not only was Jen arrested and charged with domestic battery after dragging Ronnie with her car down a Las Vegas street, she did so in front of the couple's infant daughter. It all started while Ronnie and Jen were on their way home from a barbecue. The couple began arguing in the car and that's when things turned physical. According to People, Jen began hitting Ronnie in the face as she was driving, so he demanded she pull over to let him out. When she did so, Ronnie got tangled up in the seatbelt while trying to get out. That didn't really make much of a difference to Jen, who took off in the car, dragging poor Ronnie behind the car. TMZ reports that Ronnie was bruised and bloodied after the encounter, with a serious case of road rash, which is to be expected. Baby Ariana was present in the car during the incident but was unhurt. Jen was arrested and charged with domestic battery, with bail set at $3,000. Several sources close to Ronnie spoke to TMZ and revealed that they have been urging Ronnie to keep his distance from Jen, who they believe pose a serious threat to Ronnie. Given that this isn't the first time Jen's gotten physical with him, those sources might have a point. At the beginning of June, cops were called to a Las Vegas Planet Hollywood after the couple got into a fight about the recent death of their dog and about their daughter. Jen reportedly called the cops herself but took off before they came onto the scene. That was probably wise of her since witnesses spotted her punching him in the head and spitting on him, which is a form of battery. And it's just gross and low class, which is pretty much what we've come to expect from her. Apparently, according to those unnamed sources who spoke with TMZ, Ronnie has mostly been sticking by Jen because he's afraid she'll try to take full custody of their daughter if he doesn't play ball. That's reportedly why he went to the barbecue with her in the first place, though we're probably safe in assuming that he regrets that decision now. 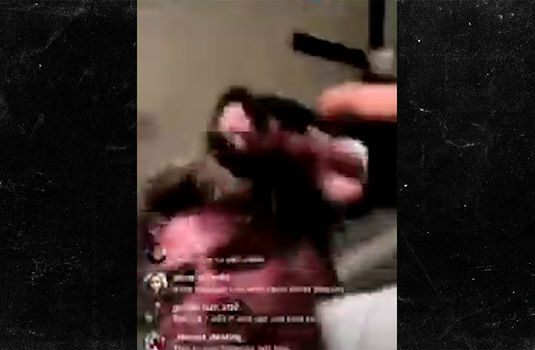 Honestly, these two are just absolutely toxic together, as their explosive Instagram live fight from back in April vividly shows. We've included the video, but be warned that there is some harsh language in it. It's great that Ronnie and Jen are trying to make things work for their child, but it's becoming ever more clear that the healthiest thing for these two to do is split up, for everyone's sake.